Marine 31 Captain’s One-Step Compound & Polish cuts like a compound and finishes like a polish, replacing the need for a separate compound and polish. What’s the advantage of Captain’s One-Step Compound & Polish? Not only do you save money by only needing to purchase ONE product to compound AND polish your boat, but you save time as well! Marine 31 Captain’s One-Step Compound & Polish works especially well on painted hulls where most marine compounds and polishes tend to leave the finish hazy and full of swirl marks. Cuts like a compound and finishes like a polish! 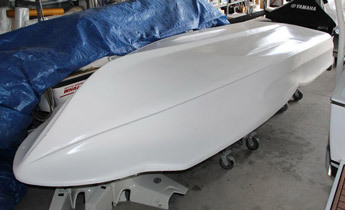 Check out the glossy section of this BLACK painted hull in the picture above. The oxidation and sanding marks were effortlessly removed, and the finish wasn't scoured or hazed in the process. 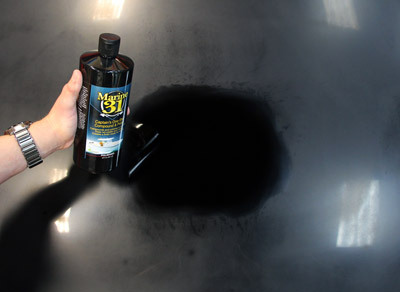 Marine 31 Captain’s One-Step Compound & Polish will be known in the marine industry as “magic in a bottle” thanks to its immense cutting ability and the swirl-free, glossy finish that it creates. Marine 31 Captain’s One-Step Compound & Polish works so well that you can use it on black hulls with confidence. Marine 31 Captain’s One-Step Compound & Polish can be applied several ways. For heavy cutting action, use with a rotary polisher equipped with a wool pad. 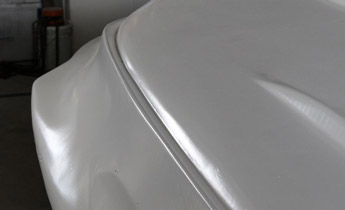 For light or moderate oxidation, use with a dual action polisher equipped with a foam pad. Regardless of your application method, Marine 31 Captain’s One-Step Compound & Polish will leave your boat looking glossier than it has ever been. Marine 31 Captain’s One-Step Compound & Polish can be used to remove oxidation, staining, scuff marks, scratches, and swirl marks. If you don’t need a lot of cutting action, simply choose a less aggressive foam pad. The abrasives in Marine 31 Captain’s One-Step Compound & Polish are so refined that you can even apply it with a soft foam finishing pad to burnish the surface to an incredibly high gloss. Marine 31 Captain’s One-Step Compound & Polish is arguably the best boat compound and polish ever made. The incredibly glossy, swirl-free finish that it creates will convince you, and the easy application will keep you coming back for more. Marine 31 Captain’s One-Step Compound & Polish doesn’t dust, and it wipes off like a wax. Marine 31 Captain’s One-Step Compound & Polish is the one-step solution you’ve been asking for. Stop using multi-step systems and reap the benefits of good chemistry! 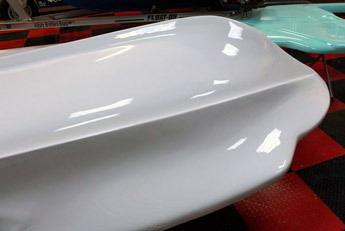 In 2014, with the help of more than 15 passionate enthusiasts from all over the world, Mike Phillips wet-sanded, cut, and buffed John Greviskis' 1960 Glastron. John Greviskis is the host of Ship Shape TV, a show that boating enthusiasts have been watching for over twenty years. Marine 31 is a sponsor of Ship Shape TV. To coincide with the project, Marine 31 introduced an all-new product to make the laborious task of compounding and polishing the boat considerably easier and less time consuming - Marine 31 Captain's One-Step Compound & Polish. I am a very skeptical person when it comes to product claims but was definitely surprised with the results of this product. Would definitely recommend to some. Thanks for a good product. I was reluctant to spend the money on this product. However, I am very glad I did. Very easy to use and the results were dramatic. Boat has never looked better. First time since 2002 the boat was compounded and polished (1 step). Worth every penny spent.